Invisalign in Michigan City is a clear aligner system that allows you to straighten teeth without having to wear visible metal braces for months and months. This is a wonderful option for adults and older teens alike -- and your cosmetic dentist at Edgewood Dental is pleased to offer Invisalign for patients who could benefit from braces. Read more below to find out about how it works, how much it costs, and whether or not you are a likely candidate for Invisalign. Invisalign works using a series of customized plastic aligners that fit tightly around your teeth. 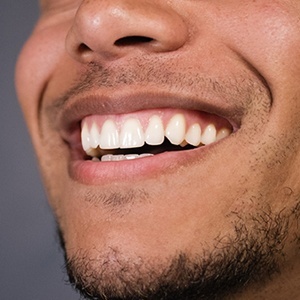 By placing focused pressure on different areas of the bite throughout treatment, the teeth are gradually repositioned and brought into the proper alignment. Each aligner is worn from one to two weeks, depending on our recommendation. 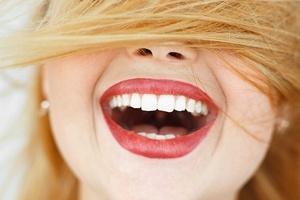 Invisalign is a largely self-directed treatment. You will attend routine visits with your dentist every six months to ensure that the treatment is progressing as it should. The average treatment lasts between 18 to 24 months. Once it is complete, a clear retainer keeps the teeth where they should be. 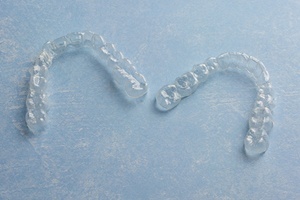 Removable aligners are easy to clean. You can continue to eat what you like, thanks to Invisalign’s removable trays. Fewer visits to the dentist are required throughout the treatment compared to conventional braces. Smooth plastic is generally far more comfortable than fixed metal brackets and wires. You can take out the aligners before big meetings and introductions. The end result is a beautiful smile with well-aligned teeth! The cost of Invisalign will depend on a few factors, including the complexity of your case and how well you comply with the treatment. Longer treatment times mean more aligners and visits to the dentist are required, which is more costly. Replacing lost or damaged aligners will also increase the cost of Invisalign. We can give you a good estimate on what you can expect to pay for Invisalign during a consultation. This treatment is typically more expensive than conventional orthodontia, but most patients find it is worth the investment for clear braces. If you are interested in what Invisalign can do for your smile, we invite you to schedule a consultation with your cosmetic dentist in Michigan City. Your dentist at Edgewood Dental will evaluate your bite and discuss your goals with braces to determine whether or not Invisalign is right for you. If it is, we look forward to getting started right away! Go ahead and contact us to learn more today.